In June 2014 we published a story on Jet Magazine, which Lombard launched in January 1990 in order to look for brand new comic talent. 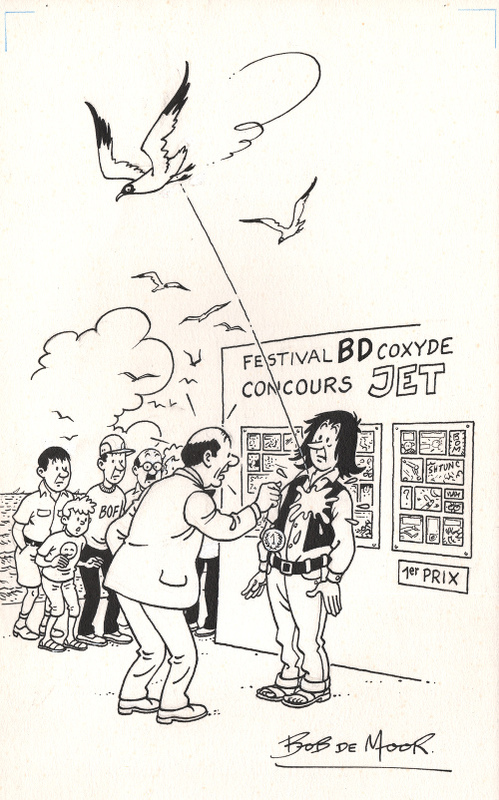 Today we offer you an original drawing which Bob De Moor made for Jet issue 9 to promote a drawing contest related to the Koksijde Stripfestival aka Strip Koksijde (and Festival BD Coxyde for our French speaking readers), which was a quite well known and popular Belgian comic festival. 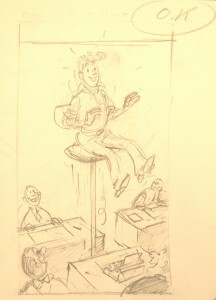 The original drawing as used for what we think was a souvenir card in 1990. 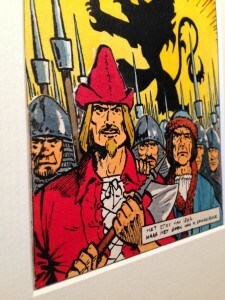 We found the original drawing (you can still see some of the pencil drawings here and there) of what must have been used for a ‘souvenir’ card, in the personal collection of Olivier Marin. On the drawing you can see a medal being handed out to the Jet contest winner. However, a black-headed gull spoils the fun as it drops some excrements on the clothes of the winning comic author. 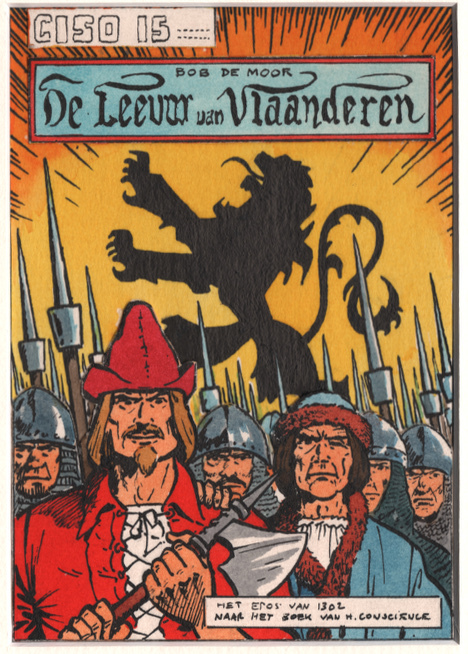 Thanks to Petja van den Hurk, we can confirm that the drawing was used in Jet issue 9, page 5. 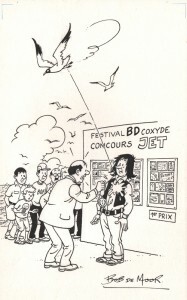 In issue 10 of Jet the magazine also announces the 2nd contest adding that the 5 winning submissions will be exhibited at the ‘Stripfestival van Koksijde’ (July 20-28, 1991). The drawing is added in small next to it. Still about the drawing, Bob De Moor also added an extra linguistic joke, namely the person wearing a T-shirt /sweater with the word ‘Bof’ on it. 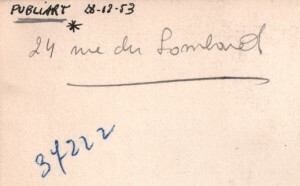 ‘Bof’ is commonly used after or before the French phrase “Je ne sais pas”, meaning “I don’t know”. Since we have many collectors reading our website, you can expect an update sooner or later. 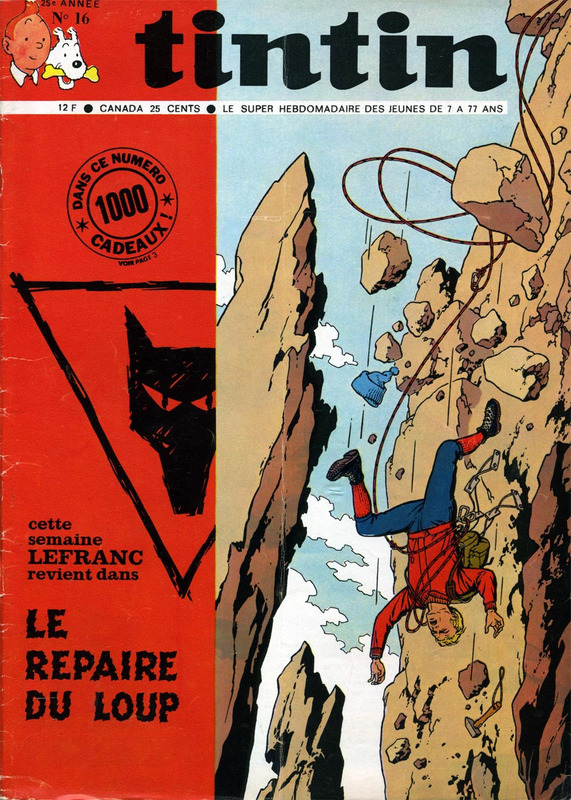 In 1970 the Journal Tintin started with the pre-publication of the Lefranc album “Le repaire du loup”. As you all know, this album was drawn by Bob De Moor under guidance of Jacques Martin. 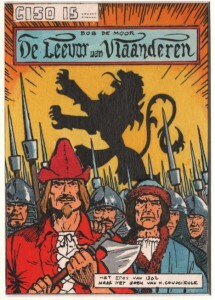 The 4th album in the Lefranc series would surprisingly only be released some 4 years later by Casterman. 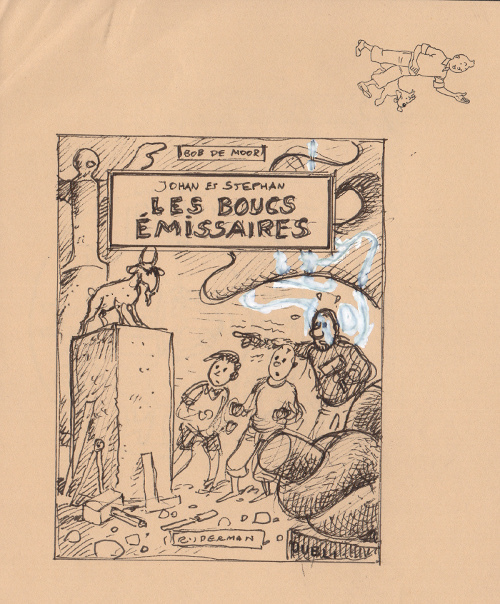 The sketch as made by Bob De Moor for the cover of the Journal Tintin number 16 of the 21st of April 1970. 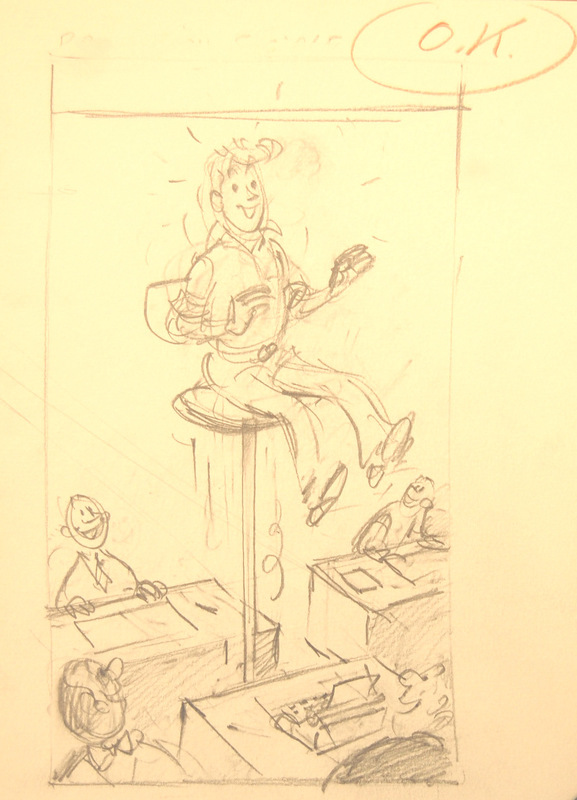 In the archives of Olivier Marin, we found a pencil drawing on Schoeller’s Parole paper of what seems to have been the sketch for what was to become the cover artwork of the Journal Tintin number 16 of the 21st of April 1970. The cover shows a falling Lefranc. But let’s take a closer look to the first and the final version, because there are some differences to be seen. 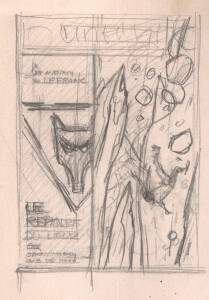 On the left you see the sketch which has a Lefranc falling in a slightly different angle, with his body more bent. His arms also point upwards and not downwards like on the published version. This is probably due to the different postures one sees in the Lefranc albums, where the bodies always tend to be a bit more stiff. 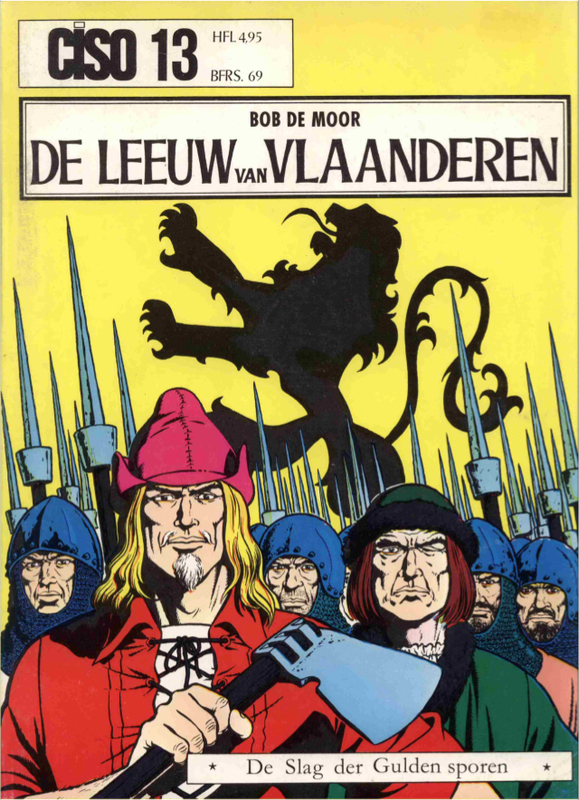 Next we see that Bob De Moor put the album title followed by “par Jacques Martin / Bob De Moor”. This was omitted in the final version and we are not sure why. Perhaps it was considered that the Lefranc series was known enough to go without the name of the authors? 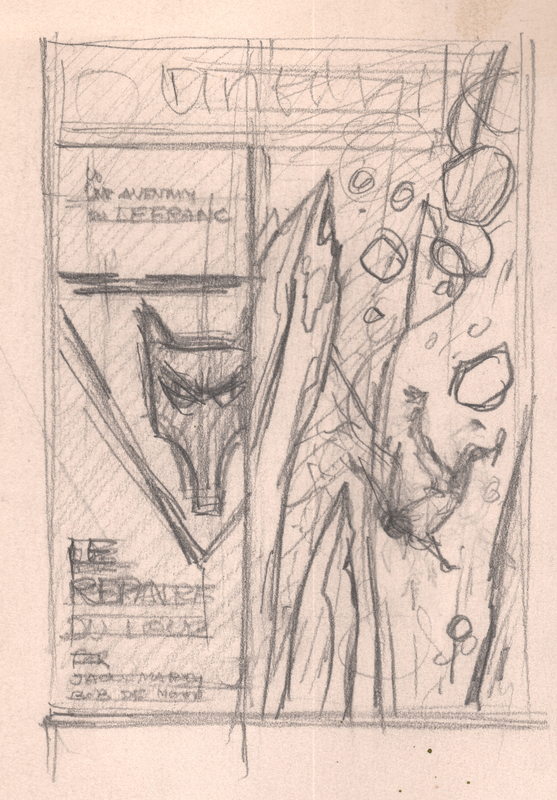 Nevertheless you can already see the initial design of the front cover with that very powerful wolf’s head on a red background taking 1/3 of the page. 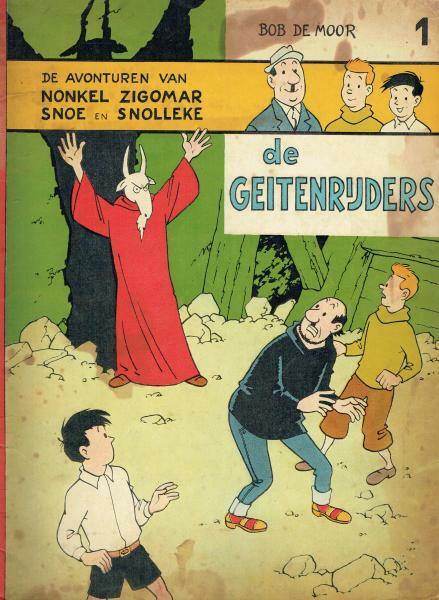 The cover of the Journal Tintin number 16 of the 21st of April 1970. 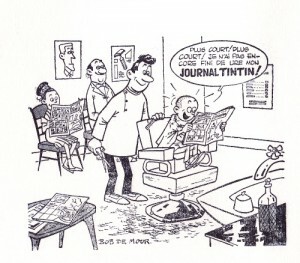 Note also that the Journal Tintin logo and baseline have not been ‘framed’ like in the sketch but instead are shown over the actual drawing letting the action flow untouched in the background. 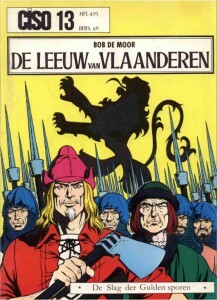 This cover is by far considered as one of the best De Moor did for the Journal Tintin, and now you can finally see that the strength was already there in the initial sketch. Reminder, this year, 41 years later, the French editor Ludovic Gombert will actually release a ‘remastered‘ big format (28,5 x 38 cm) of this album, limited to just 250. Bob De Moor congratulates Christiane & Charly in 1990! We found the invitation back in the archives of Olivier Marin (yes, it’s a name that will pop up regularly as his has quite a nice collection of rarities concerning Bob De Moor). On the drawing we find Barelli and Anne Nannah; Cori; Snoe, Snollke and Oncle Zigomar. 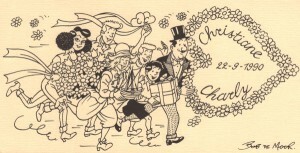 While Barelli has a ribbon with two hearts in his hands (having the letter C printed on both), Anne Nannah is carrying a bouquet of flowers. Cori decided to bring along a small miniature ship and Snoe & Snollke carry a present. Oncle Zigomar from his side is holding a huge heart shaped garland decorated with flowers and the inscription Christiane 22-9-2-1990 Charly. Missing are Monsieur Tric and Balthazar. The drawing was signed Bob De Moor and is quite a rarity, so if you find one, don’t miss the opportunity to get one for your own collection! 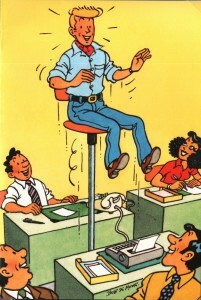 Two weeks ago you could read about a Journal Tintin publicity cartoon created by Bob De Moor. The cartoon presented on our website came from the mold used to print the cartoon in the actual publication. It was Olivier Marin who acquired this rarity and also him who made the print so we were able to show it to you. A print made from the original mold. 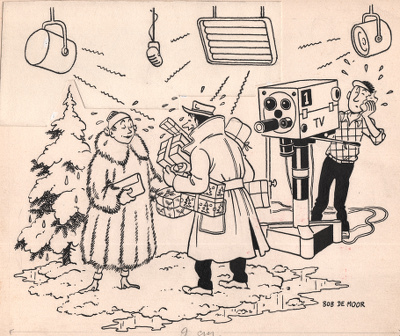 Today we present you a second cartoon, again taken from a mold which Bob De Moor collector Olivier Marin saved from destruction. 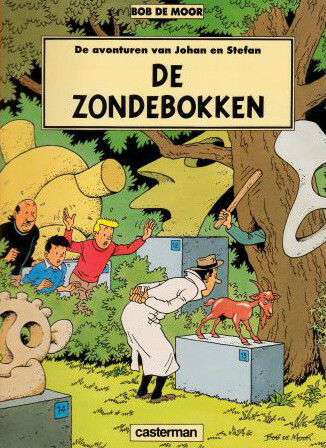 The cartoon is, unlike the previous one, in Dutch, and was used to promote Kuifje, the Flemish (Dutch written) counterpart of the French written Journal Tintin. In the drawing you can also see Monsieur Tric sitting in the dentist’s waiting room next to – surprise, surprise – smiling people. Unlike what you’d expect, they don’t show any fear because their dentists has the (latest?) issue of Kuifje ! Speaking of a unique selling proposition… You can also see a kid rushing into the dentist’s ‘operating theatre’ after the dentist says “Next!”. As you can notice there is no signature present on this print, and it wasn’t present on the mold used either. Weird. A Journal Tintin publicity cartoon by Bob De Moor. And that was the case with the drawing we present you today. The cartoon you see here comes from the mold used to print the cartoon in the actual publication. The original drawing might have gone lost or is now in the possession of a private collector who hasn’t made it public. It was Olivier Marin who acquired this rarity and also him who made the print so we can show it to you today. The cartoon is a publicity for the Journal Tintin and you can see the kid yelling: “Shorter! Shorter! I haven’t yet finished reading my Journal Tintin!” The style used here is the same as the one we have shown you here and here and can be situated somewhere in the sixties, we presume it is after 1965. 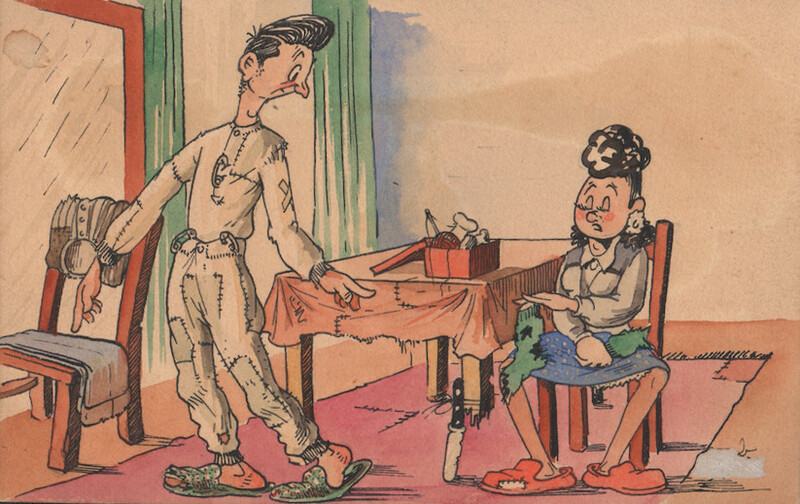 There is a whole series of these cartoons which were published back then in a similar style. We’ll present you a selection of these bit by bit. If you know where the cartoon originally has been used for, let us know!